Messenger ribonucleic acid (mRNA) is a class of ribonucleic acid (RNA) molecules that serve as chemical "blueprints" for the production of proteins, carrying the coding information from a DNA template to the ribosomes, where the transcription into proteins takes place. Messenger RNA is synthesized on a DNA template in a process known as DNA transcription. In mRNA, as in DNA, genetic information is encoded in the sequence of four nucleotides arranged into codons of three bases each. Each codon encodes for a specific amino acid, except the stop codons that terminate protein synthesis. The mRNAs then carry this information for protein synthesis to the sites of protein synthesis (ribosomes). Here, transfer RNAs (tRNAs) bind on one end to specific codons (three-base region) in the mRNA and bind on the other end to the amino acids specified by that codon, and thus place the amino acids in the correct sequence in the growing polypeptide according to the template (sequence of nucleotides) provided by the mRNA (Alberts et al. 1989). That is, the nucleic acid polymer is translated into a protein. The health of organisms depends on this intricate and precise process, which involves coordination of enzymes to transcribe the mRNA from DNA, the movement of the mRNA to the location for protein construction (from the nucleus to cytoplasm in eukaryotes), the coupling of mRNA and amino acids with the tRNA, and so forth. And this process is taking place continually in each cell in an organism. One mRNA molecule may be translated into as many as 10 protein molecules per minute, and there may be 10,000 protein molecules produced per mRNA molecule in each cell generation (Alberts et al. 1989). A 5' cap (also termed an RNA cap, an RNA 7-methylguanosine cap or an RNA m7G cap) is a modified guanine nucleotide that has been added to the "front" or 5' end of a eukaryotic messenger RNA shortly after the start of transcription. The 5' cap consists of a terminal 7-methylguanosine residue, which is linked through a 5'-5'-triphosphate bond to the first transcribed nucleotide. This modification is critical for recognition and proper attachment of mRNA to the ribosome, as well as protection from 5' exonucleases. It may also be important for other essential processes, such as splicing and transport. Coding regions are composed of codons, which are decoded and translated into one (mostly eukaryotes) or several (mostly prokaryotes) proteins by the ribosome. Coding regions begin with the start codon and end with the a stop codons. Generally, the start codon is an AUG triplet and the stop codon is UAA, UAG, or UGA. The coding regions tend to be stabilized by internal base pairs; this impedes degradation (Shabalina and Spiridonov 2006; Katz and Burge 2003). In addition to being protein-coding, portions of coding regions may serve as regulatory sequences in the pre-mRNA as exonic splicing enhancers or exonic splicing silencers. Untranslated regions (UTRs) are sections of the mRNA before the start codon and after the stop codon that are not translated, termed the five prime untranslated region (5' UTR) and three prime untranslated region (3' UTR), respectively. These regions are transcribed with the coding region and thus are exonic as they are present in the mature mRNA. Several roles in gene expression have been attributed to the untranslated regions, including mRNA stability, mRNA localization, and translational efficiency. The ability of a UTR to perform these functions depends on the sequence of the UTR and can differ between mRNAs. The 3' poly(A) tail is a long sequence of adenine nucleotides (often several hundred) at the 3' end of the pre-mRNA. This tail promotes export from the nucleus and translation, and protects the mRNA from degradation. An mRNA molecule is said to be monocistronic when it contains the genetic information to translate only a single protein. This is the case for most of the eukaryotic mRNAs (Kozak 1983). On the other hand, polycistronic mRNA carries the information of several genes, which are translated into several proteins. These proteins usually have a related function and are grouped and regulated together in an operon. Most of the mRNA found in bacteria and archea are polycistronic (Kozak 1983). Dicistronic is the term used to describe a mRNA that encodes only two proteins. The brief existence of an mRNA molecule begins with transcription and ultimately ends in degradation. During its life, an mRNA molecule may also be processed, edited, and transported prior to translation. Eukaryotic mRNA molecules often require extensive processing and transport, while prokaryotic molecules do not. During transcription, the enzyme RNA polymerase makes a copy of a gene from the DNA to mRNA as needed. This process is similar in eukaryotes and prokaryotes. One notable difference, however, is that eukaryotic RNA polymerase associates with mRNA processing enzymes during transcription so that processing can proceed quickly after the start of transcription. The short-lived, unprocessed or partially processed, product is termed pre-mRNA; once completely processed, it is termed mature mRNA. Processing of mRNA differs greatly among eukaryotes, bacteria, and archea. 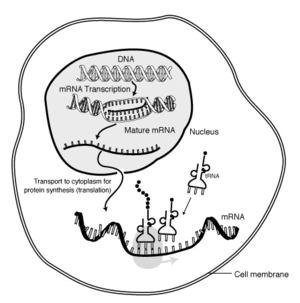 Non-eukaryotic mRNA is essentially mature upon transcription and requires no processing, except in rare cases. Eukaryotic pre-mRNA, however, requires extensive processing. The 5' cap, which is a modified guanine nucleotide added on the 5' end of eukaryotic mRNA, is critical for recognition by the ribosome and protection from RNases. Polyadenylation is the covalent linkage of a polyadenylyl moiety to a messenger RNA molecule. In eukaryotic organisms, most mRNA molecules are polyadenylated at the 3' end. The poly(A) tail and the protein bound to it aid in protecting mRNA from degradation by exonucleases. Polyadenylation is also important for transcription termination, export of the mRNA from the nucleus, and translation. The mRNA can also be polyadenylated in prokaryotic organisms, where poly(A) tails act to facilitate, rather than impede, exonucleolytic degradation. Polyadenylation occurs during and immediately after transcription of DNA into RNA. After transcription has been terminated, the mRNA chain is cleaved through the action of an endonuclease complex associated with RNA polymerase. After the mRNA has been cleaved, around 250 adenosine residues are added to the free 3' end at the cleavage site. This reaction is catalyzed by polyadenylate polymerase. Just as in alternative splicing, there can be more than one polyadenylation variant of a mRNA. Eukaryotic mRNA that has been processed and transported to the cytoplasm (that is, mature mRNA) can then be translated by the ribosome. Translation may occur at ribosomes free-floating in the cytoplasm, or directed to the endoplasmic reticulum by the signal recognition particle. Therefore, unlike prokaryotes, eukaryotic translation is not directly coupled to transcription. After a certain amount of time, the message is degraded by RNases. The limited lifetime of mRNA enables a cell to alter protein synthesis rapidly in response to its changing needs. Different mRNAs within the same cell have distinct lifetimes (stabilities). In bacterial cells, individual mRNAs can survive from seconds to more than an hour; in mammalian cells, mRNA lifetimes range from several minutes to days. The greater the stability of an mRNA, the more protein may be produced from that mRNA. The presence of AU-rich elements in some mammalian mRNAs tends to destabilize those transcripts through the action of cellular proteins that bind these motifs. Rapid mRNA degradation via AU-rich elements is a critical mechanism for preventing the overproduction of potent cytokines such as tumor necrosis factor (TNF) and granulocyte-macrophage colony stimulating factor (GM-CSF) (Shaw and Kamen 1986). Base pairing with a small interfering RNA (siRNA) or microRNA (miRNA) can also accelerate mRNA degradation. Katz, L., and C. B. Burge. 2003. Widespread selection for local RNA secondary structure in coding regions of bacterial genes. Genome Res. 13(9): 2042–51. PMID 12952875. Retrieved October 6, 2008. Kozak, M. 1983. Comparison of initiation of protein synthesis in procaryotes, eucaryotes, and organelles. Microbiological Reviews 47(1): 1–45. PMID 6343825. Retrieved October 6, 2008. Shabalina, S. A., A. Y. Ogurtsov, and N. A. Spiridonov. 2006. A periodic pattern of mRNA secondary structure created by the genetic code. Nucleic Acids Res. 34(8): 2428–37. PMID 16682450. Retrieved October 6, 2008. Shaw, G., and R. Kamen. 1986. A conserved AU sequence from the 3' untranslated region of GM-CSF mRNA mediates selective mRNA degradation. Cell 46(5): 659–67. PMID 3488815. Retrieved October 6, 2008. Life of mRNA Flash animation. This page was last modified on 18 September 2018, at 16:39.